Allison Glennon (Special Projects Coordinator) and Carly Panchura (Director of Special Projects) will be traveling to Kona, Hawaii at the end of this month begin promoting a new of Real Medicine endeavor: “Athletes for Real Medicine,” a campaign to link the increased heart rates of dedicated athletes to our from-the-heart efforts around the world. We are planning an event on May 30th coinciding the the Ironman 70.3 qualifying triathlon in the hopes of gaining support from Ironman athletes, who encompass the epitome of athletic ability (strongest bodies, biggest hearts). 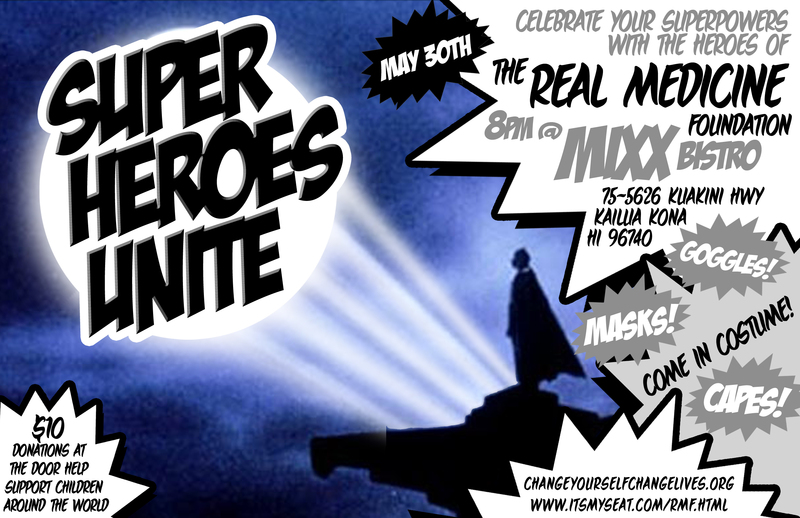 When: Saturday May 30th at 8pm (flyer attached). $10 donation at the door with all proceeds going to help the efforts of the Real Medicine team around the world. All of Mixx Bistro’s parties are themed and ours is Superheroes and we are encouraging people to be creative and come in home-made costumes. The night will be a gathering place to raise funds and awareness and honor the efforts of the Real Medicine Foundation’s superheroes who save lives everyday. Our slogan for this project is “Change yourself, Change lives” in the sense that when you change yourself for the better, work out and get healthy, push yourself above and beyond personal boundries and limitations, the positive ripple effects can potentially be worldwide.